I have a Focus FK-2001 I found in a thrift store time ago, with these switches. The case is yellowed (more grey than yellow though), the switches feel from okay to awful scratchy accros the keyboard, and the keycaps seem to be ok and seem like pad printed (I can see the surface of lettering from side and a light)? The leaves must be bended and dust must be inside. I thought on cleaning them and doing a dampened Cream transplant (linear), but I don't wanna (des)solder, and the 'switchplate' of the clones, simplified to two metal pieces, wouldn't recreate the authentic feel. Having this on hand and the price of a new Matias/Cherry keyboard, I opted for trying some kind of mod, preferably lineal. This would be my second mechanical (I have and use a Model M for 1 year now), so is great to not spend too much on it and giving me an experience with both linear and Alps type switches for a pennies (or not). My idea was opening the switches and taking everything of, unbend the 'switchplate' leaves if bended, clean the whole switch,and then put in together without the clicky leave, and without desoldering. As possible upgrade, some custom gold springs and lube, at most. Or maybe something from Matias (with the budget going far than I intended for this 'project'), but I have the feeling I will like more linear than clicky, tactile or damped Matias. Is a good idea for the work required? I heard these switches can't close once opened, or they are very hard to do at least. So if I take the leaves off the swithc to make a linear mod, would these stems close easy? And las doubt is, how is the feel of simplified Alps linear (with or without custom springs) compared with anything Cherry and linear SKCL/linear Blacks? That is something I have no experience to tell, as only tried BS, so I appreciate any feedback. Are linear Alps.tw T1 good as a first linear? I would use it mostly for typing as a silent and/or lighter keyfeel keyboard. Also got the FK-2001 way back, disassembled the switches and put every part through the ultrasonic cleaner process. One thing is for certain, it was very hard for me to put the switches back into place and had to desolder them and that still took me a while, to the point where I ended up salvaging a used alps blue board and harvested the switches and placed it on the FK-2001. I don't think it's impossible to reassemble without desoldering, just that it takes time and frustration. Also, after removing the click leaf, it still sounds noisy to me. I don't know if it's the fact these are Alps type that they are so hard to mount back, but I tried to open one switch and, indeed, it was impossible to reassemble it. The plastic of stems is kinda 'moldable', maybe these clones' stems are made cheaply but after a few tryings, the size/shape of stems looks like it could deform if too much force is exerted. I don't know if this is inherent to Alps design, or caused by age/bad building quality of the Hua Jies. Anyway, modding this stems is becoming less appealing if they even couldn't design them to close properly (which is not an issue with Alps at all, AFAIK). Will watch some more tutorials and try to do it more gently now. Yes. But, unless I need some replacement, like springs, sliders, stems, clicky leaves... I'm sticking to the ones I got (hence the linear mod, clicky leaves are unusable), and if I end soldering at some point, I'll probably go with SKCM Alps Creams, White or Black. I hope you can fill a group buy succesfully, as simplified Alps/clones are still said to be better than typical Cherry MX switches, so there I can see some appealing if you like Hua Jies more than Matias, and you can't find real/clean SKCMs. I'm curious what trouble you have had reassembling them. I find them harder to open up than SKCM, but no more difficult to reassemble, other than the usual issue with simplified alps designs where you have to ensure the contact leaves enter the appropriate slots in the upper housing. So I wonder whether I'm just lucky or missing something. 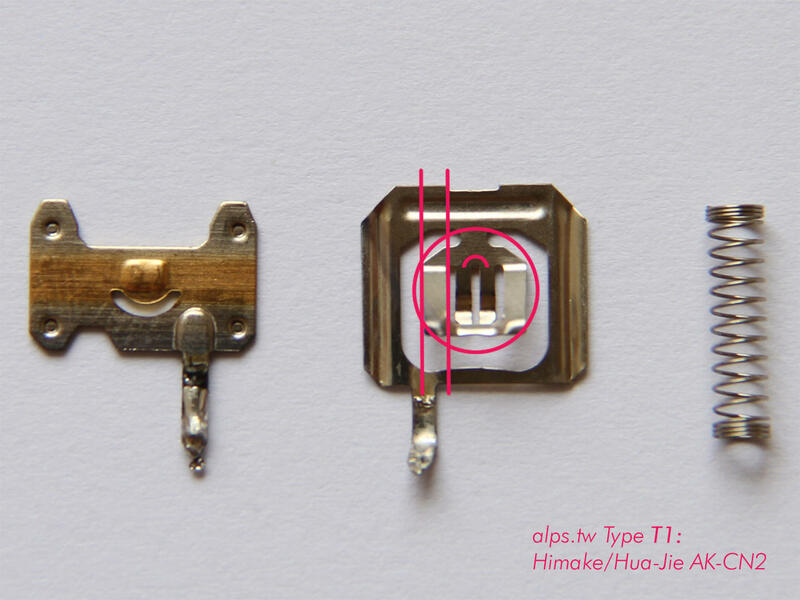 Apart from being my first time assemblig/dissasembling Alps style switches, I can't put together upper and down housing, with the alligned slots, I believed mostly due to being first time. Maybe contact leaves are bended too much? Only one side of the housing will close and where the contact leaves are, it won't fit and it will stay 'diagonal' instead. Will try to post a pictures later (been absent/busy this week so couldn't visit the forum), as soon as I can. Tbh if you want linear alps just get NOS from Taobao it's hella cheap and who knows how long supply will last. Where are they selling NOS linear Alps on Taobao? I bought some yellow alps from here with superbuy. SKCL complicated yellow alps switches. Smh there is no simplified SKCL switch. Unfortunately my keycap puller died, for being a cheapo one, so won't be showing images soon, cause can't pull the keys out w/o risking the stems. Also won't be needed to explain myself. The contact leaves are bended or, beter said, twisted. The piece of metal isn't aligned with the slots found in upper housing but, in my ignorance about Alps type tried to force them inside the slots and tried to put everything together. I took this image and added the thin red lines and circles, it's like the leaves are not only bended itself but also twisted respect to normal axis. That first switch in that image maintains housing parallelism alignment, well that isn't anymore in the one I opened, and assume all the crappy keys that ghost and return slow will have that contact leaves like that or worse. Guess my only option would be to try to unbend or untwist those. PD: don't know how to post the first image to be showed directly, sorry. Oof i would just get some new alps to be honest it's to hard to get them back into the right position and it will be inconsistent if that happened to the other switches.You could get some black alps and linear those they are better then the most available MX linears. Hmm ok, when I get a wire puller I will dissasembly the entire board and try figure out if contact leaves are too bad. My original intention was to not solder, but seeing these crappy conserved switches and knowing a near relative acquired a electronics soldering station recently, I may learn to solder and try some linear (Black, Yellow) or clicky Alps (White or Cream, or even Matias given the case) implantation to the Focus in the coming time. Thanks guys for the interest and help, will keep this updated. If you are gonna desolder for the first time get a high quality solder sucker don't make my mistake and what the others did you will give your self a hard time. Use this one works like a charm https://www.amazon.com/Engineer-SS-02-S ... B002MJMXD4 . Soldering iron doesn't need to be very high end since soldering keyboard is nothing really advanced so you can just use a 10 dollar soldering iron. Also would recommend getting some flux paste to make the tin flow easier you will get clean desolderd pads with out lifting any of them. Do NOT cheap out on the soldering iron, the cheap ones begin to fall apart, burn themselves up, and crumple up almost immediately. Get a good one with an adjustable temperature (or better yet, a soldering station, I use an old 60watt Xytronic 168-3c I got for free) Also, the cheap solder suckers have worked fine for me, I desolder several boards a month and one lasts for a few months before breaking. Plus they are so cheap I bought a stockpile of them. I guess i am lucky got mine for 1.5 years now still working like a charm since day one . It's my elder brother who just acquired a soldering station for some of his videoconsoles/electronics to solder. I haven't had the chance of going to his home lately. When I do I'll ask him about the soldering and see if it's a good one (at least I know it was like 100$+ so can't be a cheap one). Still looking daily for some decent Alps keyboard. I may go with the classic AT101W or even try to get an AEKII to linearize/mod them. Again, will the switches be in good condition and be representative of the SKCM Alps? Another option keeps being buy some ultrasonic cleaned/dirt free switches and continue with the Focus build, but as of now I've not learnt soldering and wouldn't complete it soon. So Dell AT101W/Apple AEKII seem the most reasonable option.